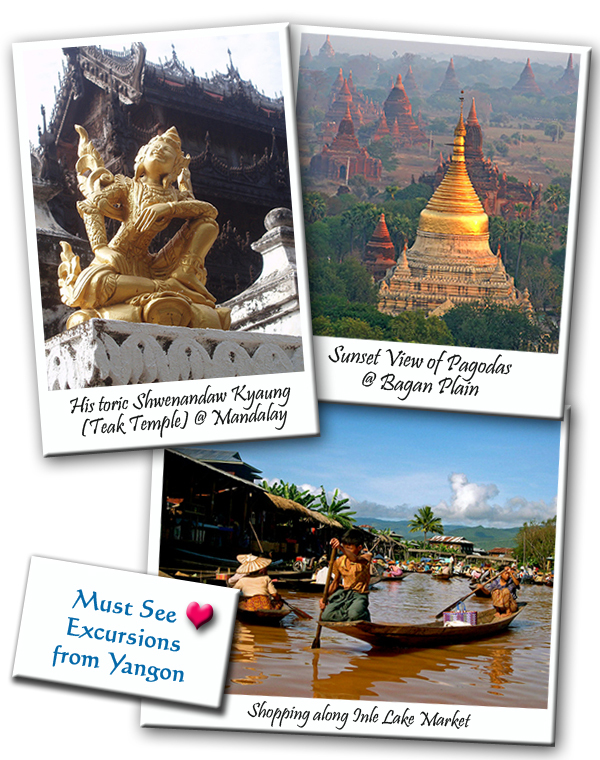 look no further than mystical Myanmar! Compared to its Indo-China neighbours with their more well-known sights and activities e.g. Thailand (shopping at Chatuchak Market), Cambodia (world heritage Angkor Wat), Myanmar is quite off the beaten track especially for independent travellers. Thus, to this day Myanmar remains one of the most mysterious and undiscovered destinations in the world. This is good news if you intend to visit Myanmar – you could avoid to a greater extent the usual trappings associated with famous tourist sights e.g. annoying touts, expensive yet tasteless tourist menus. Instead you can spend more time immersing yourself in the rich and exciting sights such as the beautiful pagodas of Yangon and interacting with locals and learning about their vibrant culture. Let me share with you in greater detail why you should consider Myanmar as your next destination for a short getaway around the region. Myanmar stretches from the sparkling islands of the Andaman Sea in the south right up into the Eastern Himalayan mountain range. It is a land of breathtaking beauty and charm which offers all the traditional delights of Asia in one fascinating country – virgin jungles, snow-capped mountains and pristine beaches, combined with a rich and glorious heritage spanning more than two thousand years. 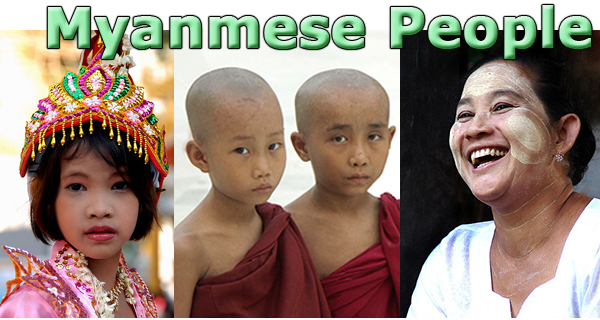 Spectacular monuments and ancient cities attest to a vibrant culture that is still home to 135 different ethnic groups. One example of such a sight is the magnificent 2000-year old Schwedagon Pagoda (also known as Golden Pagoda) which dominates the skyline of the capital city, Yangon. 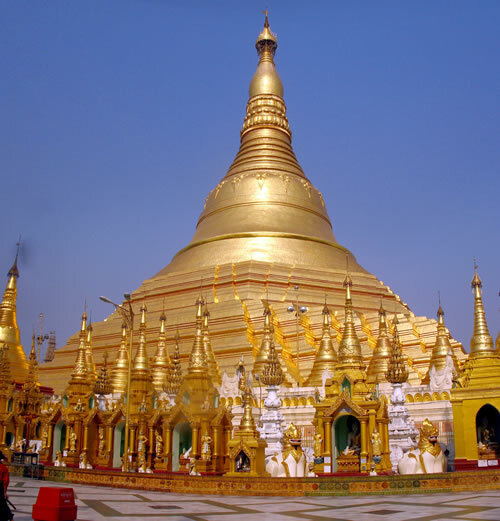 It is the most sacred Buddhist pagoda for the Burmese, containing relics of the past 4 Buddhas – even if you are not Buddhist, visiting this place will provide you with a peek into the customs of the local people. Personally, local food is always a key part of my travel experience and the high standard of Burmese cuisine does not disappoint. 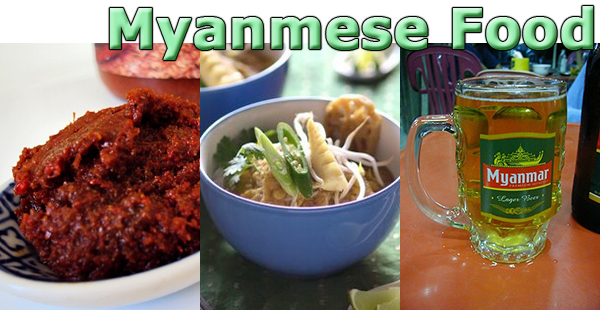 Being located between China and India, it is not surprising that the influences of these countries are felt in Burmese cuisine. Traditional Burmese dishes such as Mohinga (rice noodle with fish gravy) and the crispy condiment Balachaung (fried shrimp with chilli and tamarind) are must try food which are best washed down with a glass of Myanmar beer at the end of a rewarding day of travel. There is no better way to find out where to go for the best bowl of Mohinga noodles, than from a local Burmese. You are bound to find out so much more about the country (or for that matter – the best bargains in the city) by interacting with friendly local people Who knows, you might be invited to try the ubiquitous cosmetic Thanaka on your face. Being a Buddhist country, you might also get the opportunity to interact with little monks and nuns during their regular festivities in the city – just be mindful of local customs e.g. never touch a monk (or anyone) on the head – it is very disrespectful. Having shared on what to do in Yangon, let’s explore the must-see excursion from Yangon, mainly in the other Big Four sights. These places are easily accessible by train, bus or plane. Depending on your schedule and budget, you can consider either of those options – although be prepared for long journeys of up to 12 hours for bus & train travel. Train travel is one way to really immerse in the local culture as that is the most common form of transport among the locals and this train also passes by beautiful Myanmar countryside and mountains. Be it the sunset views of the thousands of pagodas across the Bagan plains or exploring the historic Peak temple in Mandalay, there are always plenty to do during these excursions from Yangon. Myanmar’s beaches are to date, largely undiscovered, however there are some excellent properties. The beautiful, unspoilt, white sandy beach at Ngapali is situated on the western coast and reached by a short flight from either Yangon, Bagan or Inle Lake. You can choose to sunbathe, cycle or stroll along this beautiful beach, free from noisy beachside bars, crowds and hawkers – just you, the sun and the beautiful waters (and along some stretches, some fisherman drying their catch but it shouldn’t bother you much :-)). Wherever you go in Myanmar, whether you cruise down the mighty Irawaddy River in style, drift over the ancient city of Bagan by hot air balloon, or search for that elusive tiger on the back of an elephant, there is always a feeling of adventure. What is the currency exchange? Golden Pagoda is amazing. How do they maintain it? Is it really gold or paint? I read some of your articles carefully and your content can be really useful for my readers looking for activities in and around Singapore ! Your blog is fascinating, and I really enjoyed reading about your adventures everywhere..
Good job again and keep on traveling!